A couple of weeks ago I had the opportunity to attend and present on a couple of topics at the MWALLT conference in Minneapolis. (MidWest Association for Language Learning Technology). As I am new to the region it was a great opportunity to meet foreign language educators in the region and to share some ideas and best practices in using new technologies for language learning. 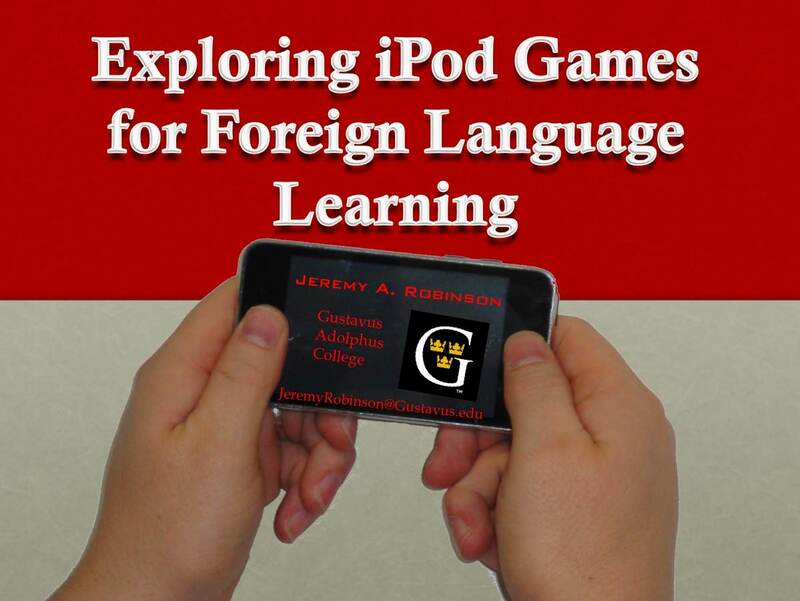 One of the topics I presented on was “Exploring iPod Games for Foreign Language Learning.” Instead of focusing on those many iPod Applications which have been designed to practice verbs or learn new vocabulary, I focused on using games which actually use the language being studied. In this sense we are able to learn language through use – or through play in this instance, instead of merely learning about language. Learning through play is a powerful motivational tool and the addictive nature of videogames adds to the effect. In the presentation I discussed three iPod game genres: Adventure Games, Quiz-like (or gameshow) Games, and Simulation Games. In once sense, most if not all of these games have some element of simulation. When a player begins a game he or she takes on a character, and must complete some objective. 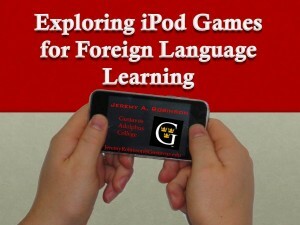 As he or she continues to play the game in the language the focus is not on learning the language, but using language as a tool to complete some their objective. One of my favorites would have to be the classic edutainment game “Oregon Trail.” For $5 I can purchase the game for the iPod and play in English, Spanish, Italian, French, Japanese, or German. For those who are less familiar with the game, you begin the game by choosing what kind of individual you are (banker, farmer, carpenter) and make your way across the plains to Oregon. Along the way you have to talk with individuals, make desions, buy supplies, and have a lot of fun, all in the target language.